The update to iOS 8.1.1 may have fixed some of the more ridiculous and irritating bugs that iOS 8 / 8.1 had managed to introduce, but it also has one undocumented benefit that will no doubt prove highly useful to those carrying iPhones and iPads with just 16GB of internal storage. Even though many have reported that they still need huge amounts of free space in order to install iOS 8.1.1, many have found that once they’ve gone through the entire update process they’ve been left with more space than when they started. A report coming out of iMore shows that an average gain of 500MB free space is being opened up after the iOS 8.1.1 installation is complete, though your mileage will obviously vary on the final figure. The reasons for the return of the extra space could be many, but we wouldn’t put money on anything other than the system getting a cleanout of cache and temporary files during the update. We’re happy to be proven wrong if someone has the facts to hand, though. While 500MB might not sound a lot to those with 32, 64 or even 128GB iOS devices, those with 16GB know only too well that space runs at a premium on the lower-end hardware. Having fought to install updates on smaller devices ourselves recently, we’d kill for an extra 500MB at times. At least now, when the next release of iOS does drop you’ll have 500MB-worth of a fighting chance when it comes to an OTA install. Still, we’d much rather Apple sort out why its supposedly delta update require so much space in the first place. Maybe we’re just being awkward though. iOS 8.1.1 was solely a bug fix and performance update, if the changelog is anything to go by, and is aimed squarely at those with older devices, such as the iPad 2 or the iPhone 4s. Though the update has sped up devices for some, and when we look at the calendar, we would love to give out the suggestion that it’s really time for an upgrade. 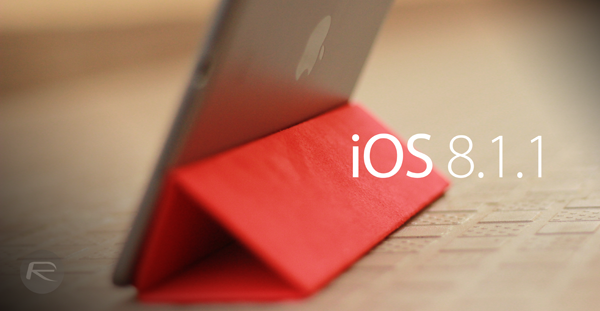 If you care about jailbreaking though, DO NOT update to iOS 8.1.1 as it breaks the Pangu8 iOS 8 – 8.1 jailbreak. and for my iPhone 5 only a 100MB! No problem, buy two i5 or one 5s and you are on 500 MB. On iPhone 6+ I went from 1.8gb to 2.6gb free. 800mb for me works out nicely. And you are the only one who didn’t realize that it’s a joke. Gratz. I did realise that it was a joke! But not a good one! Fair enough. So tell us a good one! ?